Push-up stations provide a fun, low impact outdoor training tool and opportunity for all skill levels to improve fitness. The ergonomic design of this station helps decrease joint stress and tension allowing users to target multiple muscle groups and increase range of motion. Encouraging fitness and outdoor activities is made easy with the addition of outdoor fitness equipment—it is inviting, accessible and without that intimidation factor. Strategically placing this outdoor fitness equipment along trails, near playgrounds, and in community centers to provide a well-rounded workout circuit for the community. 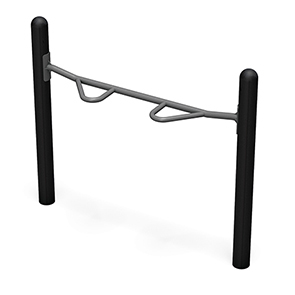 These modern all-steel powder-coated Push-Up stations are engineered to provide wide-range of upper body strengthening exercises. This apparatus can be installed at various heights when grouping several together to offer diversified levels of challenge. Strengthens abdominals, obliques, chest, shoulders, and triceps. Push-Ups: Compound exercise uses chest, arms, and core muscles simultaneously. Sit-Ups/Crunches: Tightens core muscles to improve posture and decrease back pain. Helps align neck & back properly.